Beginning in the late 1990s, the pine forests of Montana began to experience the largest mountain pine beetle outbreak in recorded history. 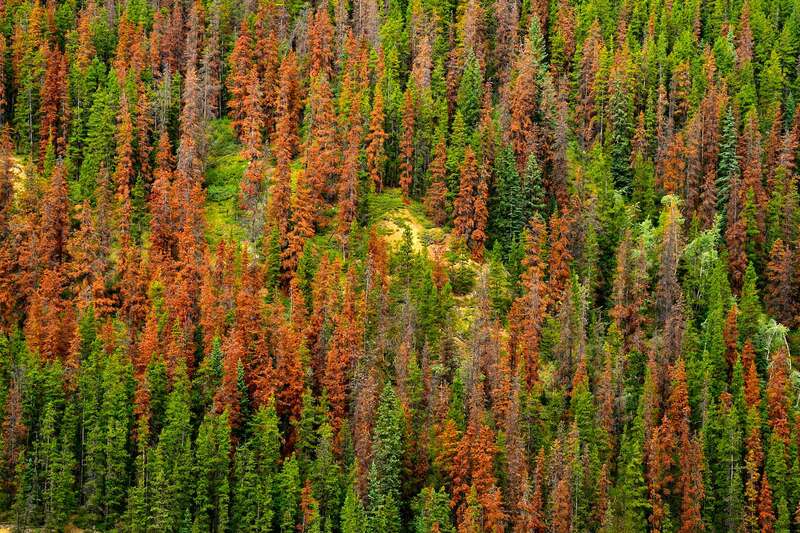 Large swaths of forests began to turn red, then gray as the beetles ate their way through Pacific Northwest stands. At their peak in 2009, this native insect infested nearly 3.7 million acres statewide, leaving dead or dying trees in their wake. The infestation became a hot topic not only among those concerned with forest management, but also among the wood products industry. By 2014, pine beetle numbers began to decline with new infestation totaling about 600,000 acres. A majority of the trees killed were lodgepole pine, but the beetle also killed ponderosa pine – both commercially important tree species in Montana. During the height of the epidemic approximately 7.4 billion cubic feet of timber were affected. The impact of the mountain pine beetle on the forest products sector has been high and continues to affect wood supply. Dead or dying stands still spot the landscape and the longer these trees remain unharvested, the less useful they become. 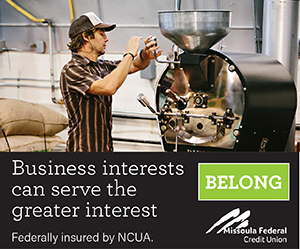 In 2014, the Montana forest products industry converted 93.1 million board feet of lodgepole pine and 69.4 million board feet of ponderosa pine into lumber, house logs, pulpwood, posts and poles, log furniture and industrial fuelwood. However, sawmills across the state were only operating at 62 percent capacity, partially due to a timber supply shortage caused by the beetle. 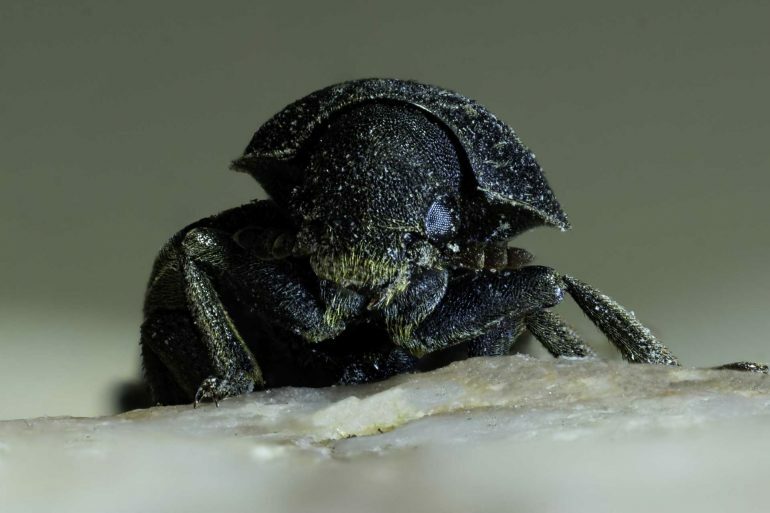 As the epidemic has slowed, new data address the financial impact of the beetle on Montana’s forest products industry. The data quantify changes in log quality, grade, value, volume, product mix and costs across the supply chain. It begins when a tree is attacked. Initially, the tree responds with biochemical and physical defenses, including secondary resin accumulation at wound sites. But damage by the beetle to the living tissue and the introduction of fungi that spreads across the sapwood can disrupt the transport of water and sap, killing the tree. Trees that do not survive move through a series of visually distinct stages – green, red and gray – from live to dead, with parallel and increasing tree damage from a commercial value perspective. During the first year following an attack, water flow slows and stops. The needles tend to retain some moisture and remain mostly green. During this stage, trees retain most of their commercial value. Some will survive an attack by producing enough resin to pitch out the attacking beetles as they bore into the inner bark. Generally, the impact on sawmill operations is minimal during the green stage. Some log grade defects can be an issue. Grade defects include any flaw or character in a log tied to wood quality that reduces the log from one grade to another. Some examples include knots, blue stain, holes and bark pockets. About one year after an attack, the tree’s needles will begin to lose their moisture and pigment molecules will break down, turning the needles red and brown. Over the next two or three years, the needles will fall to the ground. Both grade and scale defects become noticeable during this stage. Scale defects are those that reduce the scaled mass or volume of a log. 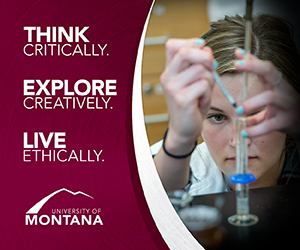 They include rot, shake and severe checks and cracks. Trees in the red stage are subject to three primary classes of value loss: 1) volume losses due to breakage during harvest and handling, 2) volume losses due to rot, shake and checks, 3) reduction in the lumber grade due to deterioration-related defects, such as staining, secondary insect damage and bird peck. These grade and scale defects impact the overall value of the logs. Montana sawmills receiving timber in the red stage reported that cracking and checking was their biggest issue, followed by breakage, rot and shake, heart defects, then insect/bird damage and stain. These changes affect the product mix – what sawmills can do with the resulting timber. From the green to red stage, sawmills reported a 15 percent decrease in sawlogs and a 54 percent drop in post and pole logs, with a threefold increase in pulpwood and a small change in firewood (Table 1). Table 1. Timber product distribution in the three stages of mountain pine beetle mortality and percent change in product classes between stages. Source: BBER. Costs in harvesting timber also changed. Sawmills reported a 35 percent drop in stumpage costs, a 15 percent increase in logging cost, an 18 percent rise in loading and hauling costs, and a 15 percent increase in milling costs (Table 2). Table 2. Changes in stumpage and operations costs between the three stages of mountain pine beetle mortality. Source: BBER. Following the red stage, after the tree has lost all of its foliage, it enters the gray stage where it can remain for years. Over the course of the gray stage the fine branches fall, bark flakes off the stem and the wood of the stem continues to deteriorate. Finally, the tree falls to the ground. During this stage the tree has lost much of its commercial value. Sawmills receiving timber in the gray stage reported a 51 percent decrease in sawlogs, a 60 percent drop in post and pole logs and a 160 percent rise in pulp logs. The percent of logs best suited for firewood increased nearly sevenfold (Table 1). Harvesting costs changed as well. Sawmills noted a 46 percent decline in stumpage costs, a 28 percent increase in logging cost, a 28 percent rise in loading and hauling costs, and a 31 percent increase in milling costs (Table 2). Overall, as trees moved from the green to gray stage, the product mix and costs changed radically. There was a 58 percent drop in sawlogs, an 82 percent decrease in post and pole logs, and a tenfold (992 percent) increase in pulp logs. Trees best suited for firewood went from zero to nearly 13 percent (Table 1). Related costs changed as well. There was a decrease in stumpage costs (81 percent), an increase in logging costs (43 percent), loading and hauling costs rose 46 percent, and milling costs climbed 46 percent (Table 2). The mountain pine beetle has had a significant negative impact on the wood supply in Montana. But there are other reasons to value trees – some are market-oriented, such as forest products, but timberlands also have nonmarket values, such as aesthetic, spiritual and ecosystem services values. Figure 1. 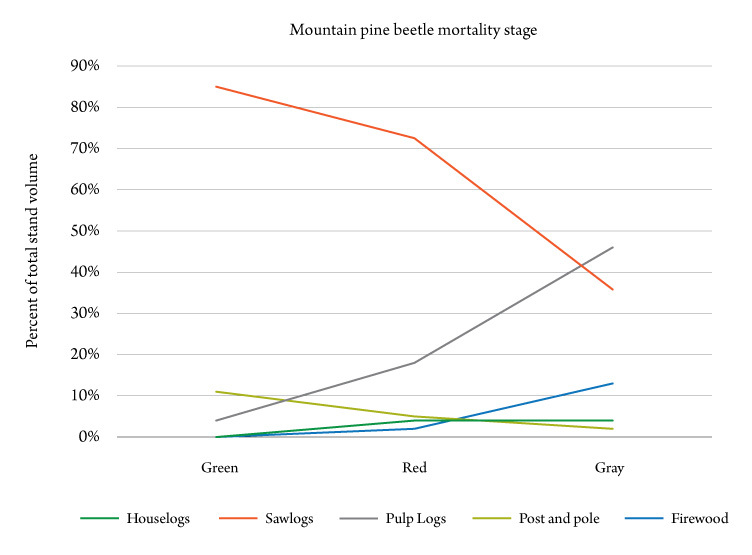 Average distribution of products for harvested stands in the three stages of mountain pine beetle mortality. Source: BBER. Clearly, increased costs and a lower recovery volume make economically efficient beetle kill salvage more difficult the longer a high mortality stand remains unharvested. If a stand is determined to be suitable for salvage harvesting, the longer harvesting is delayed, the greater the economic risk (Figure 1).